Our Most Repinned Images: Part Two! Are you following us on Pinterest? If not, you're missing out on some of the best wedding ideas around! 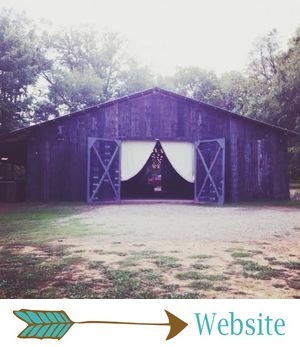 We not only pin photos of our gorgeous weddings, styled shoots and events at The Barn, but we also pin some of the prettiest wedding ideas from wedding websites and blogs. We've got boards of photos from weddings at The Barn, which are divided into colors (example: At The Barn: Pink Weddings). We've got everything ranging from Ceremony inspiration to Wedding Favors and Bridal Party Gifts and The Dress to Let Them Eat Cake. One of our new (and cutest) boards is Pets in Weddings! 3. A lot of our most repinned images are cakes! Who doesn't love cake, right?! This cake is certainly one of the cutest. It's simple, modern and adorable. Perfect! 4. Back in December, I posted an inspiration post about New Years Eve wedding ideas, full of gold, glittery, sparkly goodness. These bridesmaids' and flower girl dresses have been a total hit with pinners! And I can see why... They are fabulous! 5. Our followers love gold! As a gold-obsessed glitter fanatic myself, I can't blame them. ;) Also from the New Years Eve post, these sparkly gold cakes have been extra popular on Pinterest. The only thing more fun than eating cake is eating sparkly cake! 6. This wedding cake is gorrrrrgeoussssss. Rustic-chic, simple, and elegant all at the same time. Plus, the flowers are stunning. It's no wonder why pinners love this one! 7. I was surprised (and happy!) to see that this is our most repinned bouquet photo! I figured it would be something pink and full of peonies and garden roses. ;) Anyway, this purple and green bouquet is stunning, and I hope we'll see more purple weddings at The Barn in the future! 9. Told ya! Our followers love cake. :) I posted this wedding cheesecake in this wedding cake alternatives post (still one of my favorite posts), and it's been a hit! 10. This baby blue and gold wedding color palette inspiration is stunning! We see lots of pink and gold weddings at The Barn, but I don't think we've had blue and gold... someone get on that, because it's beautiful! As you can see, our most popular photos are all quite different. We don't just post one style of wedding on our Pinterest... we try to show a little bit of everything, so no matter what your style is, you can find some inspiration on our boards!